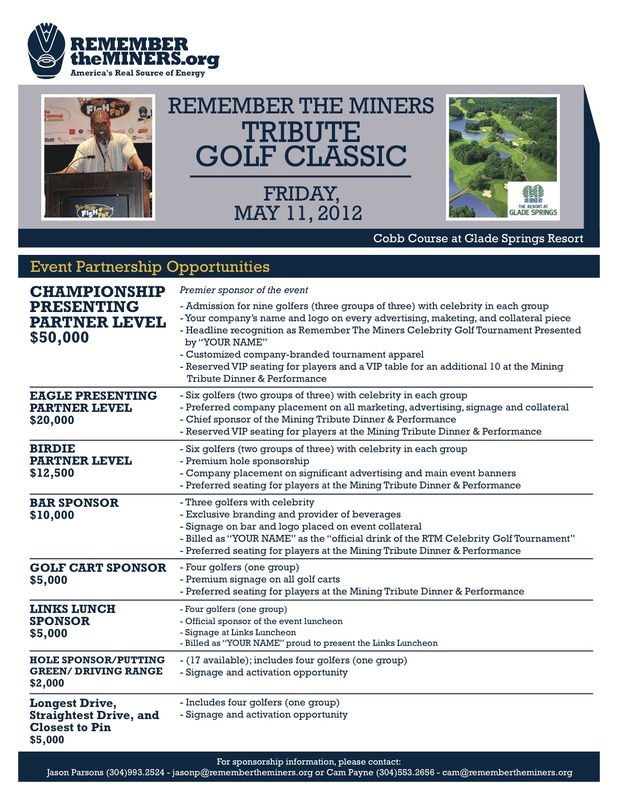 Remember The Miners Tribute Golf Classic to be held May 11th. It’s a privilege for us to involve some of West Virginia’s most notable philanthropists and raise money to help educate the future of the coal industry. Remember The Miners is excited to announce its first annual golf fundraising tournament, the Remember The Miners Tribute Golf Classic. The tournament will be held Friday, May 11th at Cobb Course at Glade Springs Resort in West Virginia. Four-person teams will play the course. Sponsorship packages are available, and include the option of being assigned a celebrity to complete a team with three players. Registration will begin at 8:00 AM with a shotgun start at 9:30 AM. A cocktail reception will be held following the tournament, in addition to a seated dinner. During the dinner, awardees of the Pritchard Mining Scholars Class will be announced. A silent auction, raffle, and other announcements will also be a part of the day’s activities. The tournament will benefit the Remember The Miners Scholars Program, which has awarded tens of thousands of scholarship dollars to students pursuing higher education in the mining industry. For sponsorship info, contact Cam Payne at cam(at)remembertheminers(dot)org. For more information, like Remember The Miners on Facebook or follow them on Twitter. Remember The Miners is a public awareness campaign dedicated to telling the story of America’s real source of energy: the coal miner. By building valued partnerships, Remember The Miners raises awareness through events, media, and the Remember The Miners Scholars Program.